We have received some gorgeous shrimp from our CSF, which much to our dismay made its final delivery for the season on Thursday. I especially love the green tints in the tails. Fairy wings must look like that. The bounty of shrimp has led to a recent cooking extravaganza. 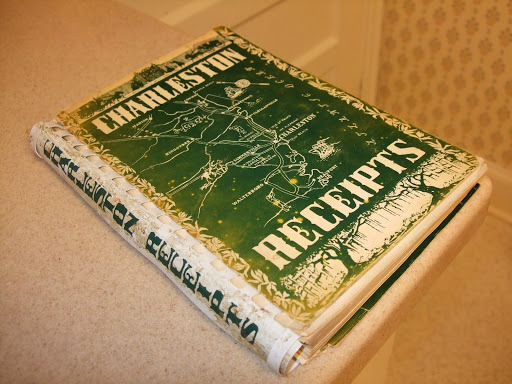 In preparing them, I’ve referred to an old and dear favorite of Southern cooks, Charleston Receipts, for ideas. My copy, the 1973 edition, was snatched from the jowls of death while I was in college, grabbed from a pile of cookbooks a family friend was tossing out. It’s easy to see why a suburban housewife would not want this filthy thing lurking on her tidy shelves. The cover isn’t even physically attached anymore. Still–how could someone throw away a book with 28 “receipts” featuring shrimp? I’m quite fortunate to have help whenever we cook shrimp. 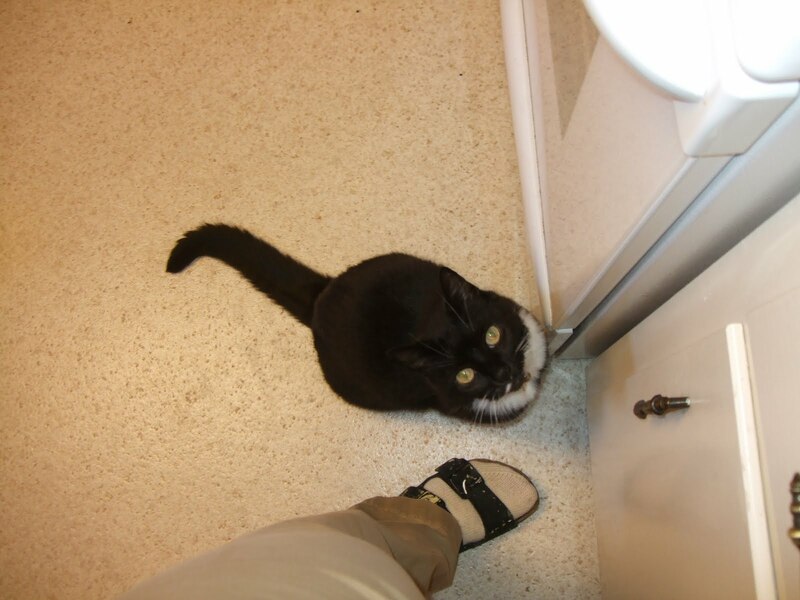 Louise waits patiently in this exact position throughout the process, ready to clean up any stray bits that might happen to fall on the floor. Neither of these recipes comes from Charleston Receipts, exactly, but some of those dishes served as inspiration. You’ll note these two dishes are very similar–we had fresh jalapenos to use up! This dish was actually better the next day. Heat olive oil in large pot over medium high heat. Saute onion and jalapeno in oil until onion is translucent. Add garlic and stir. Add peas with enough water to cover them by an inch or two. Cover and bring to a boil over high heat. Reduce heat to low (but high enough to keep liquid at a simmer). Add bay leaves, salt, and tomatoes. Cook, covered, for about 45 minutes or until peas are tender, stirring occasionally. Add water as needed to keep peas covered. (Bring to a boil again if you add water, then reduce heat back to low.) Once peas are tender, whisk together flour and cream until flour has completely dissolved and no lumps remain. Add to peas and mix thoroughly. Add shrimp. Cover and cook for a few minutes until shrimp has turned pink, stirring frequently to keep sauce from sticking. Serve with rice or cornbread. Heat olive oil in large pot over medium high heat. Saute onion and jalapeno in oil until onion is translucent. Add garlic and stir. Add cumin and coriander and stir. Add water, rice, salt, bay leaf, and tomatoes. Bring to a boil over high heat. Lower heat to a simmer; cover and cook until rice is tender, about 40 minutes. Add beans and cream and cook until beans are heated, a few minutes. Add shrimp. 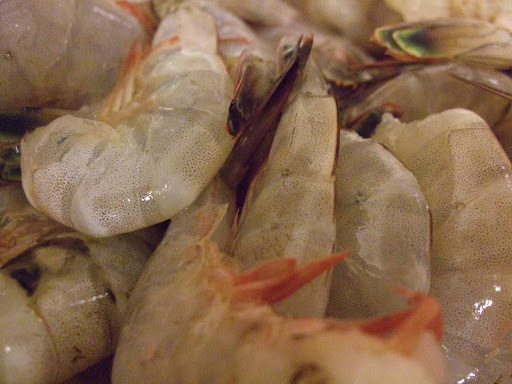 Cover and cook until shrimp is pink, 4 – 5 minutes. Serve with cornbread. This entry was posted in Cookbooks, Fish and Seafood. Bookmark the permalink. Ah yes! I should have cropped. Oh well. here's an ignorant Midwestern question– do I need to soak the black eyed peas before cooking? Hulga–no, you do not. 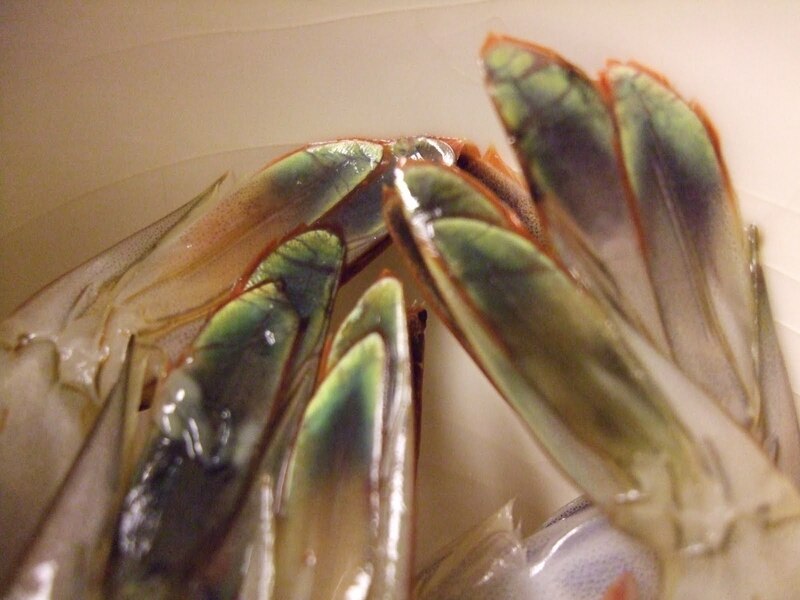 Bringing them to a boil and then cooking them covered on lower heat will do the trick. They are small enough that they cook pretty quickly. You can use the same technique with other beans instead of soaking, but the cooking time will be longer. Can you even find black eyed peas in Minnesota?